Khalil is a graduate of Boston College (BS) and Holy Cross Greek Orthodox School of Theology (M.Div.). He has worked for the Orthodox Church in various roles including Assistant Camp Director at Antiochian Village and Youth Director at St. George Orthodox Church of Boston. Khalil began studying iconography in 2006 and continues to learn each day. Khalil has completed many icons for private commissions and for the parish of St. Barnabas the Apostle Church in Sunbury, Ohio. In March 2012, Khalil received the blessing of His Eminence Metropolitan Philip of New York (Antiochian Archdiocese) of thrice-blessed memory to accept commissions from parishes in the Antiochian Archdiocese. 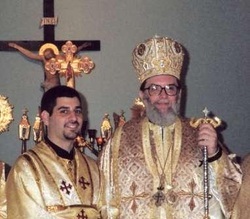 Khalil is a Subdeacon in the Orthodox Church, and serves at St. George Orthodox Church in Boston, Massachusetts.. He and his wife reside outside of Boston, with their children, and black lab named Fenway.